Six Apart, the company behind blogging platform Movable Type, has just announced a new social application called Motion that integrates social network-like activity streams, microblogging support, and dead simple login functionality for visitors that allows them to quickly leave comments and even tie in their own activity feeds to your site. The new application will be free for all users of Moveable Type Pro, the site’s premium service, once it leaves beta in 2009. For now, you can sign up for a free demo of the Beta version here. 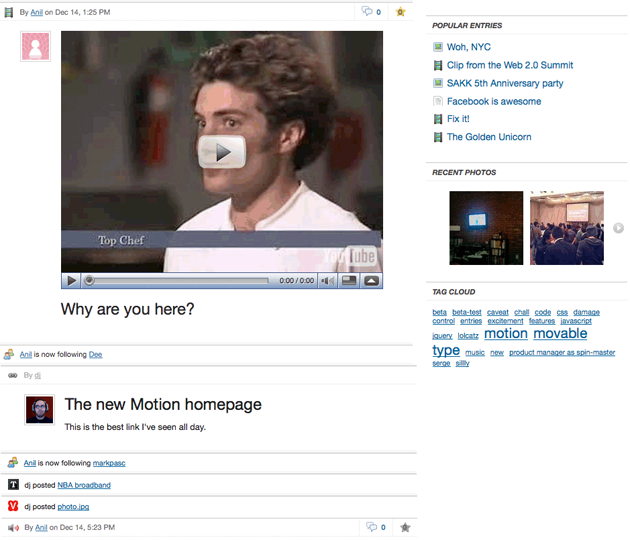 Motion is build around open standards, allowing users to create their own microblogs that pull in events (in a manner similar to FriendFeed) from over 150 other sites supported by Six Apart’s Action Streams, which launched earlier this year. The service also offers full support for OpenID, allowing users to login with their Google accounts, Facebook Connect, AOL screen names, and Yahoo IDs. * Create a private, custom action aggregator to track sentiment and glean intelligence from conversations around the web through action streams. * Provide a private microblog community for simple internal employee or team collaboration. * Publish a public microblog to nurture and grow your community while increasing your page views. * Create a public social network to connect to your community across the web instead of competing against other social networks. At this point there aren’t any sites that have actually implemented Motion so its hard to get a feel for how well it works, but Six Apart says that they’ll have a demo live some time this evening (we’ll update the post once they do). You can read more about Motion on the application’s product page here.